Jeanie, age 81; Will, 84; and Adina, 90, are bound by their relationship. 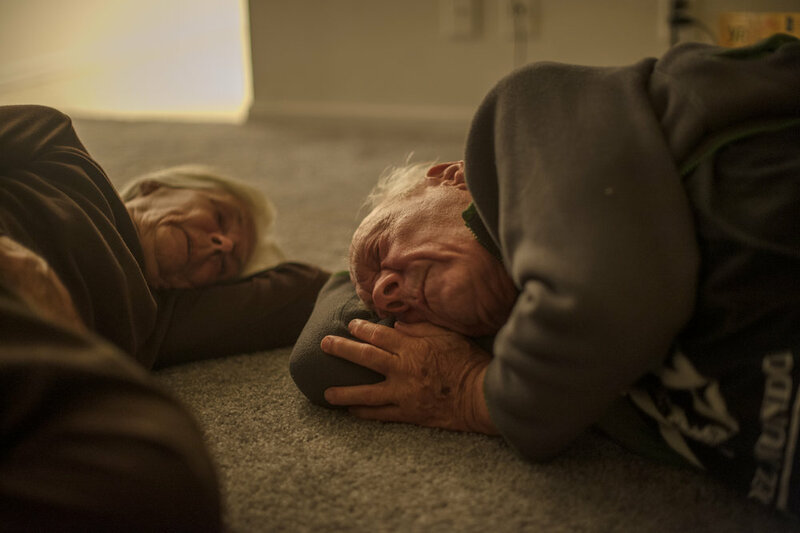 “Senior Love Triangle” is a long-term photo documentary that shadows three aged individuals in a romantic conflict. They view their connection as a shield from the loneliness of aging. 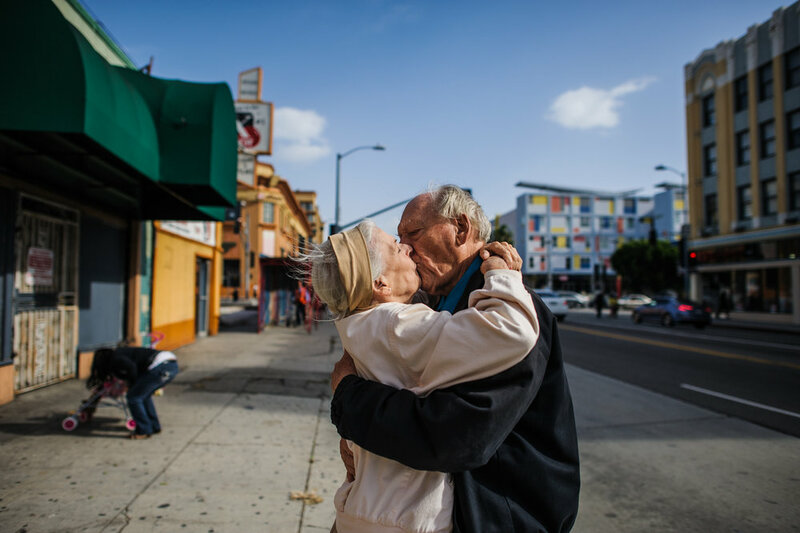 Even though Jeanie, Will and Adina’s relationship began at a senior care facility in Los Angeles, California, the outside world is more like home. 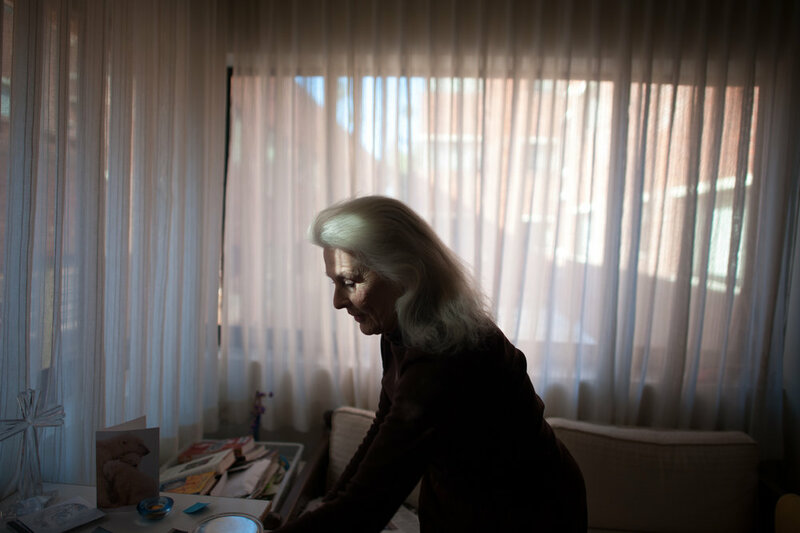 For them, the care center is a reminder of solitude. Attempting to find solace within themselves, they seek escape with each other. In describing their bond, Will shares, “We live above the law. Not outside the law, but above the law. 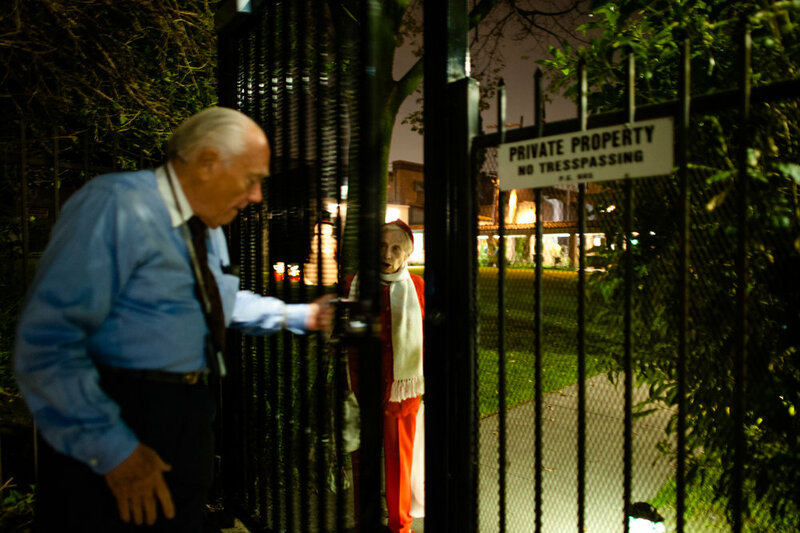 We are not outlaws.” In his late 70s, Will moved into a retirement home where he met Adina. Eventually they formed a relationship and Will moved into Adina’s apartment. After being kicked out of the retirement home for violating terms of his lease, Will moved into another facility where he met Jeanie. Not wanting to break off his relationship with Adina after falling in love with Jeanie, Will opted to continue maintaining his bond with both women. 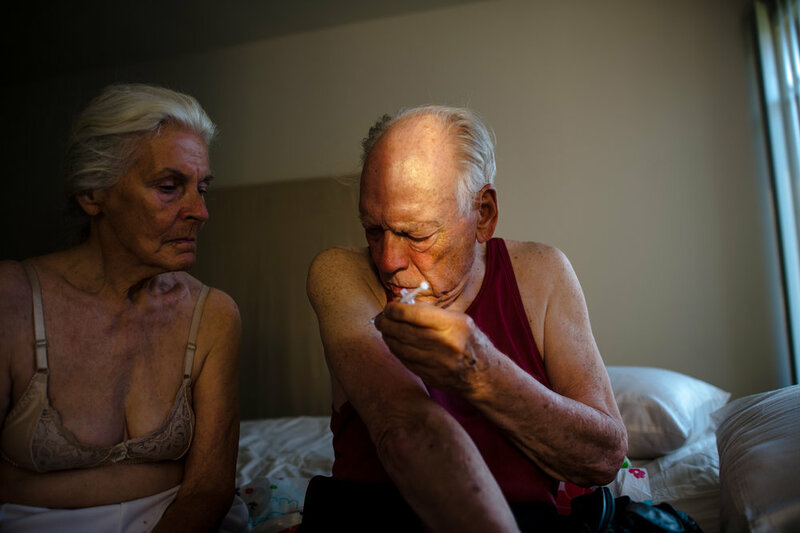 Through their relationship, Jean, Will and Adina challenge socio-cultural norms projected about the elderly. Jeanie, reflecting on her life, confides, “I do not wish to assume all the garments of maturity.” Jeanie seeks empowerment, reiterating, “I want to be free.” For these individuals, aging is paradoxically a form of both loss and liberation. Attempting to find solace within themselves, they seek escape with each other. When I am part of the lives of Jeanie, Will and Adina, I feel I am engaging in questionable activity, in something different. Each day we searched for a new “adventure,” a purpose. I felt the comfort of being part of the group. But the thrill revealed sadness. I, too, experienced the remoteness that one can feel even when part of the group, or pair. I felt the ache that dwelled just below the surface of their romanticism. Jeanie, Will and Adina share lunch at a diner in Los Angeles. Adina holds Will’s hand as they stand on a street corner. Jeanie looks up at Will, as Adina stands beside them. Jeanie gets ready to meet Will and Adina. Jeanie and Will embrace in the street, as Adina sits inside the gate of the retirement home. Jeanie places her hands on Will’s shoulders, as he sits at the bus station, while Adina stands with them. Jeanie, Will, and Jeanie gather on a street corner. 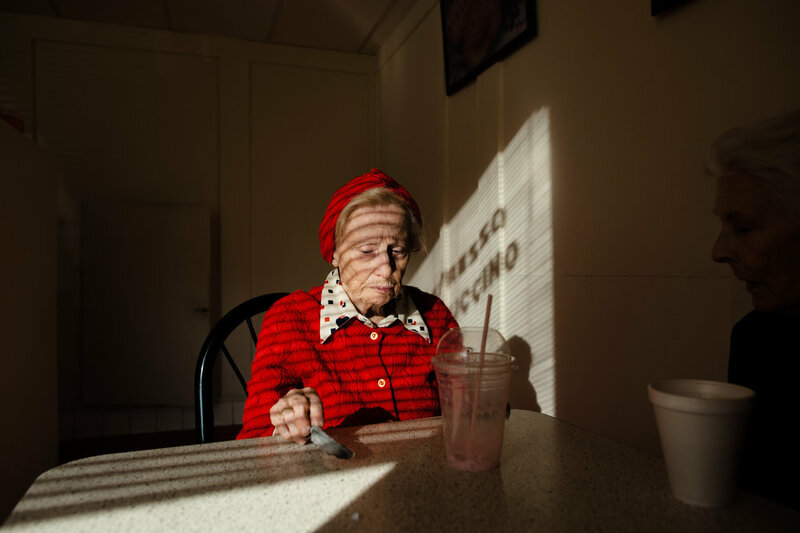 Adina holds a bird’s leaf she collected, as she sits with Jeanie at the donut shop. Jeanie sits in a U-Haul van that Will rented for him to live in; after being kicked out of the retirement home where Jeanie lives for punching a man who flirting with her, Will became homeless and decided to rent a van to park on her block, which he could sleep in. Jeanie and Will kiss at dusk before saying good bye. Will grips his face in frustration, as Jeanie and Adina look at him, while they sit at a bus stop, resting after a long walk. Jeanie places her head on the wall, realizing that Will will not return to live at the retirement home because he punched another male resident who was allegedly flirting with Jeanie; Jeanie does not know where Will has gone. Jeanie and Adina next to a staircase at a mall near the retirement homes where they each live. 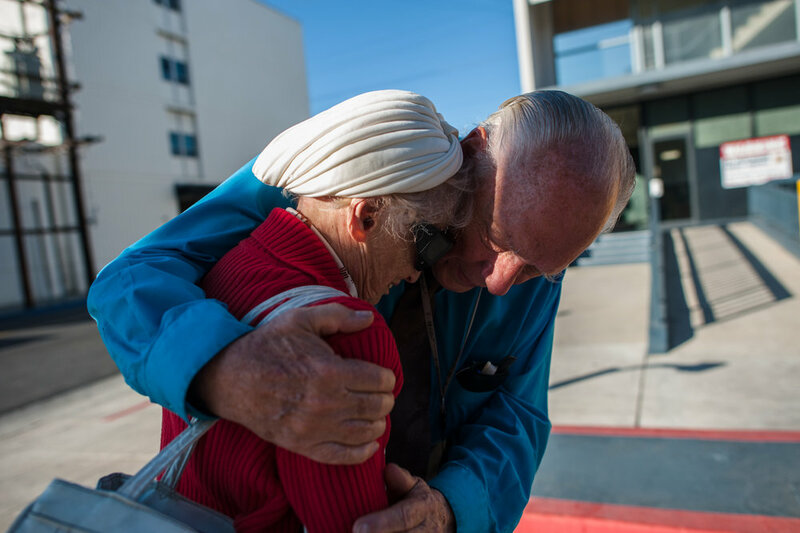 Will comforts Adina who does not want him to leave, as they stand near the entrance of the retirement home where she lives. Jeanie sits separate from Will and Adina at the ice cream shop. 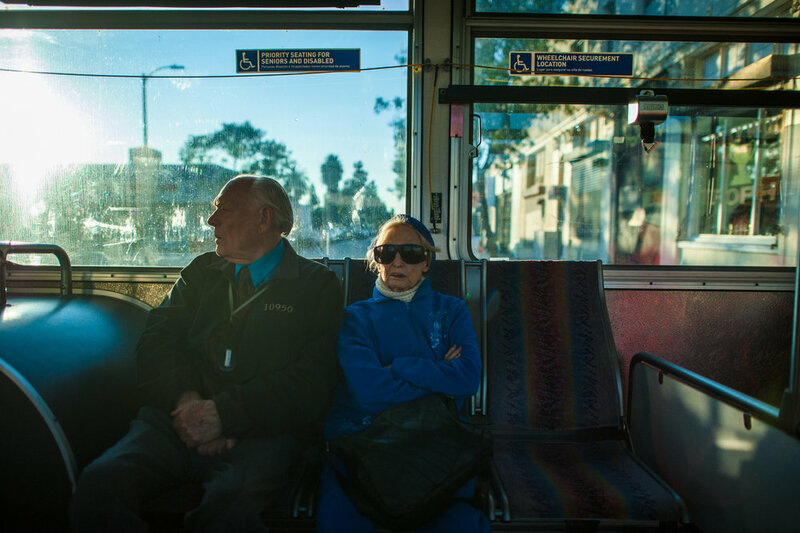 Adina and Will ride the bus in Los Angeles. 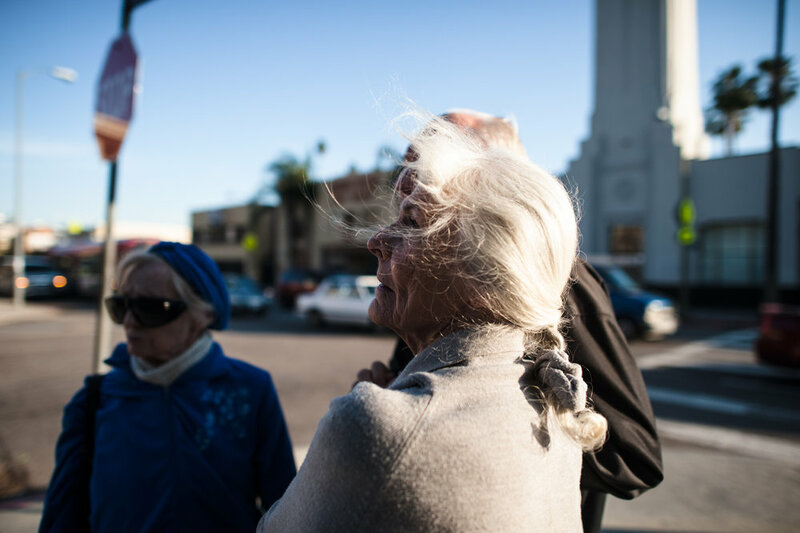 Adina stands on the sidewalk in Los Angeles, as Jeanie holds Adina’s hand while having a conversation with Will. 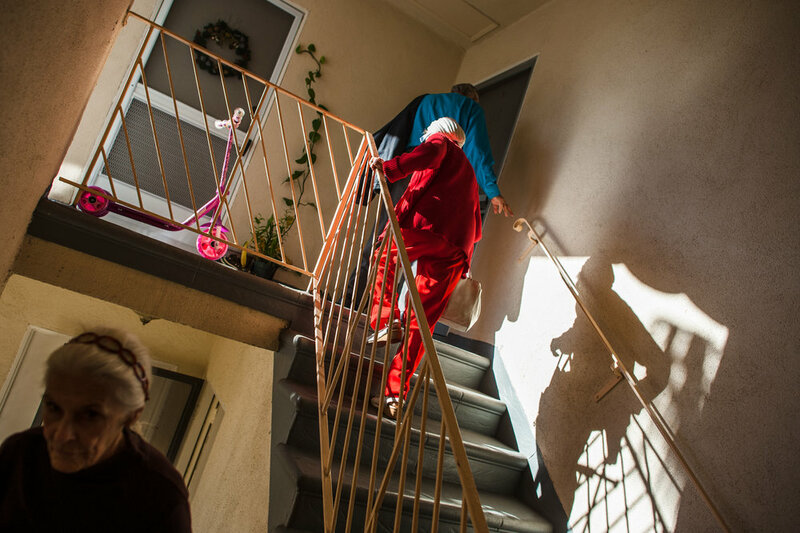 Adina, Will, and Jeanie climb a staircase to visit an apartment where they all may reside together. Jeanie and Will lie on the bed at his newly rented studio apartment in Los Angeles. Will yells in Jeanie’s face during an argument. Jeanie walks in the street after experiencing one of Will’s outbursts. Jeanie speaks to Will on the phone in her friend, Barbara’s, apartment; Jeanie speaks to him from her friend’s room because the facility will not put Will’s calls through to Jeanie’s room. Adina and Will converse before Adina returns to her apartment at the retirement home on New Year’s Eve. Jeanie, Will, and Adina share a soda during an outing. Jeanie and Will cross the street at night. Will reclines on the floor of his studio apartment, as Jeanie sits beside him, at night. 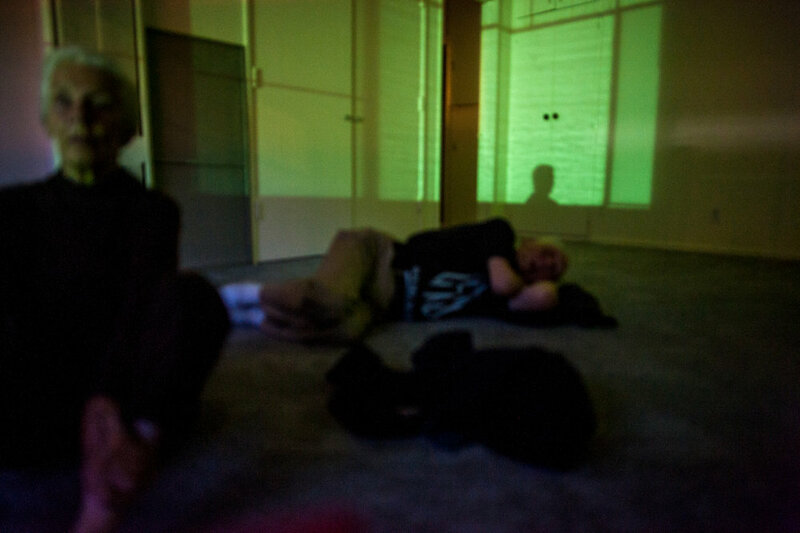 Jeanie and Will embrace on the floor of his studio apartment at night. Will stands with his eyes closed, wearing his World War II Veteran cap. Will’s fist on the carpet. Jeanie and Adina embrace Will in the supermarket aisle. Jeanie looks at Will, as he puts his jacket on, after an argument. Will smiles as Jeanie grips his face. Will speaks on his cell phone, as Jeanie interacts with the donut shop owner’s son who looks at a floor covered in spilled coffee. Will shuts the gate door on Adina at night after a daily outing. Will and Jeanie on the floor of his apartment. Will folds Jeanie’s jacket and places it behind her head, as she sits by the window at his apartment. Will and Jeanie sit on his bed, as he administers insulin to himself. Passionate about solitaire, Will searches for the game on his computer at night. Jeanie, Will, and Adina walk in the park on a Sunday. Jeanie, wearing an outfit she bought, sits on the bed with Will before they kiss. Jeanie and Adina discuss Will’s emotional distance from them, as Will walks into the donut shop where they often have coffee. Will and Jeanie’s hands touch under a table. Will lies on the floor of his apartment. Will looks down at Jeanie from his apartment window, as she decides whether she will return to the retirement home where she lives for the night.